Construction works have commenced on the next stage of expansion of Orion Springfield Central shopping centre, with a sod-turning ceremony held onsite on 3 April 2014 to officially commemorate start of works. 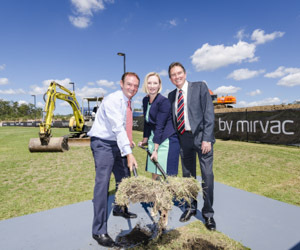 The ceremony was officiated by Mirvac’s Chief Executive Officer and Managing Director, Susan Lloyd-Hurwitz and Ipswich Mayor, Councillor Paul Pisasale. This next stage of development will bring a new Event Cinemas, Target and Coles to the Centre, along with approximately 80 additional retailers, including fashion, cafes and restaurants and a new family focused tavern to the area. In addition, the Centre’s public areas will be enhanced with new landscaping, water features, art installations and improved pedestrian links to Robelle Domain, Springfield Central Train Station and the University of Southern Queensland. Works are targeted to complete in December 2015. Mirvac’s Chief Executive Officer and Managing Director, Susan Lloyd-Hurwitz said: "We are delighted to formally commemorate the start of construction of the next stage of expansion of Orion Springfield Central. The development represents an investment of $154m by Mirvac and is designed to increase the centre’s entertainment and retail offer in response to customer feedback and population growth in the Greater Springfield region and trade area." Ipswich Mayor Paul Pisasale said "the beginning of construction of the next stage of Orion marked a significant milestone, not only for Springfield’s development, but for the whole city."